There’s plenty to think about. It’s not as easy as I thought to just wander the earth. Turns out there is a wave of anti-immigration sentiment in this country and my place here, as blessed as I am, is challenged as a result. There’s signs of changing demographics all around. Just up the road from Fede’s family’s farm, the little town of Galeata has the largest percentage of immigrants as it’s total population in all of Italy. It’s not big and not terribly strange to me as person raised in the nation of immigrants but I can tell people aren’t really advertising their diversity. There’s folks from West Africa, Eastern Europe, Morocco and Northern Africa. They’ve come to do much of the same work that immigrants do in the US. Cleaning houses, manual labor, etc. The folks up the road mostly work in a huge chicken processing plant. Many Italians appear to be freaking out about this. Especially in this conservative, white Northern part of the country, many figures in politics are capitalizing on the age-old fear of change to gain political points. The Lega Nord, one of the most extreme right parties (who flesh out the radical fringe of Berlusconi’s right-wing coalition) are reportedly famous for open support of fascism and accusations that immigrants are subhuman. These guys have proposed succeeding from poorer, darker Southern Italy even. I come into this picture as a small drop in the ‘extracommunitarian’ unEuropean wave. New legislation and widespread mistrust have made it harder and harder to get a visa to stay here. After visiting office after office, talking to person after person who half-knows a part of increasing net of red tape, I’m really feeling a lot of sympathy for the people who really want to come here just to feed their families. I’m white. I’ve got options. But if I want to stay here I have to go through a whole series of hoops that could take years. I’d like to try but I can’t even apply from inside the country I’m learning. What about all the other folks just looking for a break? This country’s riches, like my own, are built on the backs of the poor. To add insult to injury, those folks that DO make it here, like those in the US, are increasingly subject to really bald racism. Take this sign we came across in one of the little villages we spoke in yesterday. 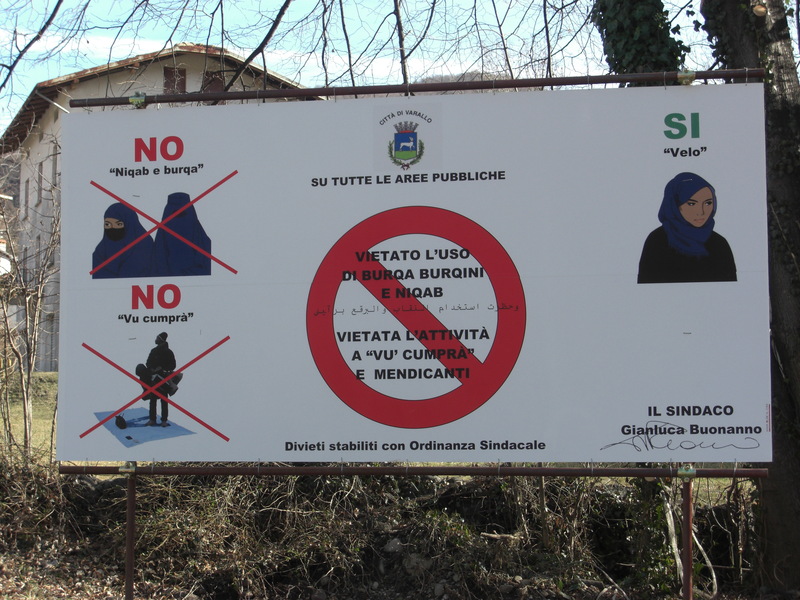 We met with folks from this town and asked what they thought about their mayor posting signs like this at every entrance to their village. They all seemed to be appalled, but apparently it’s been years they’ve been up and they’re still there. I didn’t get a chance to take a picture of my addition to this sign, but it felt like a bit of a hopeless gesture on my part. Shame on them.